The first funeral service for 41st U.S. president, George H.W. Bush, took place Wednesday at Washington National Cathedral. Donald and Melania Trump, as well as all four living former U.S. presidents and their first ladies, were in attendance. 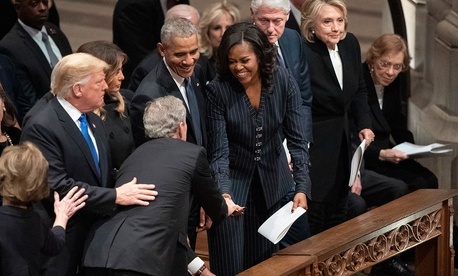 When George W. Bush, the 43rd U.S. president and late Bush’s son, went up to greet these former U.S. leaders, he slipped something into Michelle Obama’s hand that made them both smile. It was an emotional day for the Bush family, but Bush still found time to give out some candy or a mint. As some people pointed out on Twitter, this exchange was not one-of-a-kind. During senator John McCain’s funeral in September, Bush, seated next to Obama, handed her a cough drop from his wife and former first lady, Laura Bush. The video of the exchange went viral, and many people praised the touching and bipartisan gesture. Bush told People magazine that he and Obama shared a sense of humor, and when he handed her that cough drop at McCain’s funeral, “it was a genuine expression of affection.” Obama also told NBC Today that she and Bush have a special connection because they are often seated together. “He’s my partner in crime at every major thing where all the ‘formers’ gather. So we’re together all the time,” she said. The exchange at McCain’s funeral later became an inside joke between the two. Even though Bush and Obama were not seated together during today’s ceremonies for the late Bush, the 43rd U.S. president still managed to keep up the tradition—with grace and even humor—at his own father’s funeral.